Women’s boxing tonight: WBC & WBA Female Light Welterweight Championship in Argentina! Monica “La Gata” Silvina Acosta held on to her WBC Female Light Welterweight Title and picked up the WBA Female Light Welterweight Title last night after 10 full rounds of boxing. She picked up the decision over a plucky Michelle Larissa Bonassoli with the judges scoring the bout 96-94, 97-93 and 98-92. While La Gata won the bout handily, those at ringside thought the 98-92 score did not quite reflect the action in the bout. 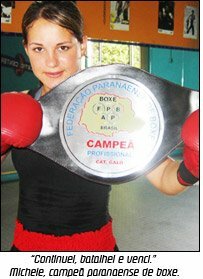 In a co-Main Event bout, Argentina’s own Monica “La Gata” Silvina Acosta (15-0-2, 2-KOs) will be fighting Brazil’s own Michelle Larissa Bonassoli (10-5, 9-KOs) for the WBC Female Light Welterweight Title and WBA Female Light Welterweight Title tonight at the Polideportivo Municipal, General Conesa, Buenos Aires, Argentina. The fight is promoted by Mario Arano and will be televised on Argentina Direct TV. Both fighters are considered to be savvy dangerous fighters although La Gata has proven herself to be very successful since winning the WBC Female Light Welterweight title. Her last defense was back in September 2011 against Erin McGowan. Michelle’s last fight was a year ago when she defeated Adriana Zanella with two knockdown’s at :51 into the first round. Chances are the fight will be available on YouTube! « Engaging in the ring on International Women’s Day!